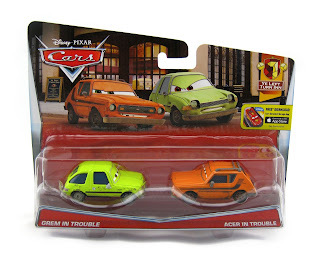 Here we have a brand new Cars 2 1:55 scale diecast release from Mattel... Grem in trouble and Acer in trouble! This "movie moments" 2-pack is part of the 2015 "Ye Left Turn Inn" sub-series (numbers 5 & 6 out of 7). There have been many releases of these characters over the years, but this take on them has yet to be done until now. Both Grem and Acer feature [subtlety] new concerned facial expressions, representing the scene when they both crash into the Ye Left Turn Inn pub in London (which aggravates the locals). Find this set in stores now!